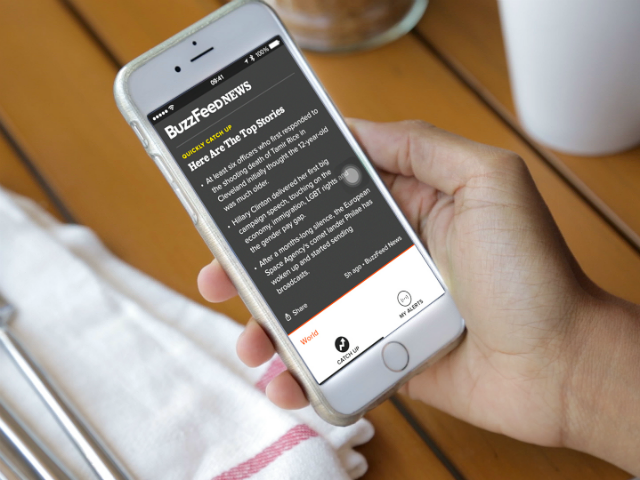 The app highlights the top stories from BuzzFeed, and around the Web. BuzzFeed has announced the release of its BuzzFeed News app on iOS, combining BuzzFeed’s stories with major news from around the Web. The app focuses on quick news consumption, allowing users to “catch up” on the most important current stories in a scrollable feed, with content selected by BuzzFeed’s editors. The catch up feed begins with a bulleted list of top stories, before breaking each down (and offering more stories) as users scroll. The app contains more than just the headlines, as each story is presented alongside a short summary, and some also include further background information to help readers understand the context or importance of each story. Finally, the app supports embedded newsworthy tweets and GIFs which autoload as users scroll. Users can tap to head to BuzzFeed or the appropriate news source to read each complete article, and can share each story via text, email, Twitter or Facebook, and so on. Outside of this home feed, users can customize their notifications, prompting the app to send push notifications for only the most breaking news, for all worldwide news, U.S. specific news, sports, business and more. BuzzFeed News is available to download for free on the iTunes App Store. The app is coming soon to Google Play.